Fresh off the press is a recording from Friday night's party in Brighton. Pablo played before and after Andrew Weatherall. Here's the first part of the night. A nice selection of disco meets dark electronic beats. 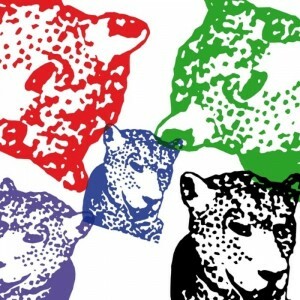 Free heat here in the form of a 15 track 'album' from the ever elusive Tiger and Woods camp. Fortunately, there isn't a golf club in sight and the album features a selection of edits of the disco, house, funk and soul sounds that they have come to love. You can grab it here. The tracks are also available to stream below. There are some nice suprises hiden here and their reworkings are never dull. "We love it when you discover something new in a song you already know. If the edit is just meant to "fix the beat" or just extend it, then it's not our cup of tea". Check this beast out, any party could do with a bit of this. Neil Diablo has been on fine form of late and this is a superb release. Grab it soon on vinyl 300 copies won't last too long. Up for it house & disco mix I made for my brother's 30th recently. A bit more upbeat than the usual deeper mixes. 120 to 126 bpm. Click the links to buy the tracks. Soundcloud blocked it for copyright. They won't stop me posting it here though. Fresh selection from Pablo Contraband. Turn the music up is a straight shot of boogie with a funk chaser. I like it! I have this one from Bill Brewster's Secret Weapons series. Here Rayko has put his spin on the track 80's loopy stomp with a hint of Miami Vice in the guitars. Not everyone's cuppa Rosie but hey you don't have to download it. It's Pablo Contraband's birthday and he's throwing one hell of a party to celebrate it with. 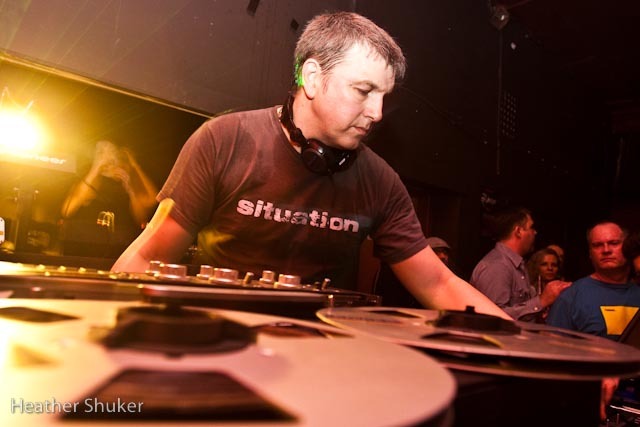 Greg Wilson is everything that we love at Disco Deviant, he always comes along and gives us one hell of a performance, surpassing our expectations and sending us home with a massive smile and a load of great memories. He has been instrumental in cementing the night's popularity in Brighton and loves playing here. Rayko will be jetting in from Madrid and dropping some of his bombs upon us all. 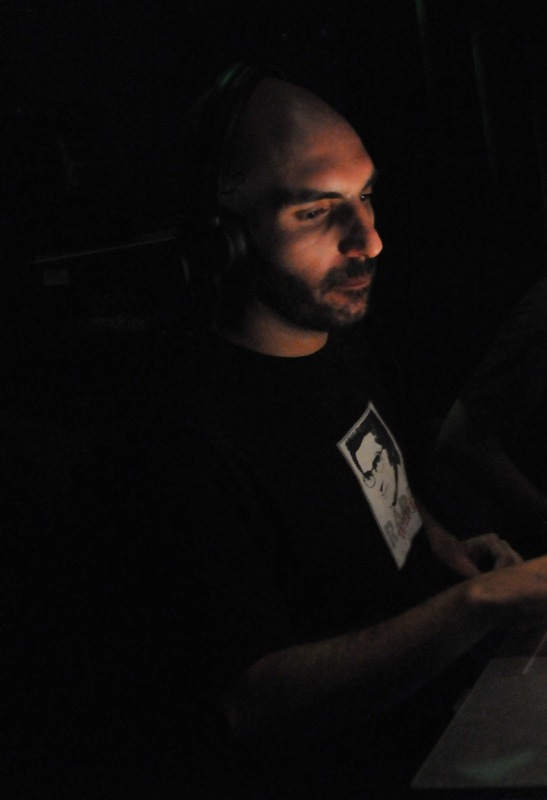 Rayko's brand of electronic boogie and disco restyled to suit today's dancefloor have made him very popular. His legion of soundcloud followers are testament to that fact and he is currently a very busy DJ & Producer playing gigs all around the globe. 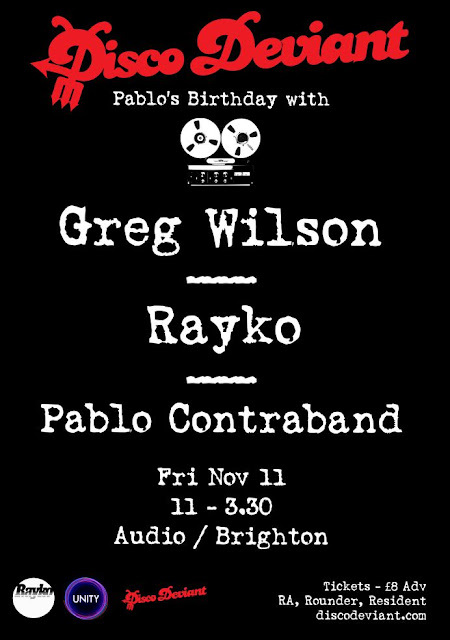 Being that it's Pablo's birthday it's only natural he will be playing a set at some point in the proceedings to mark the occasion. Expect that tickets will go pretty quickly for this one so don't hang about. 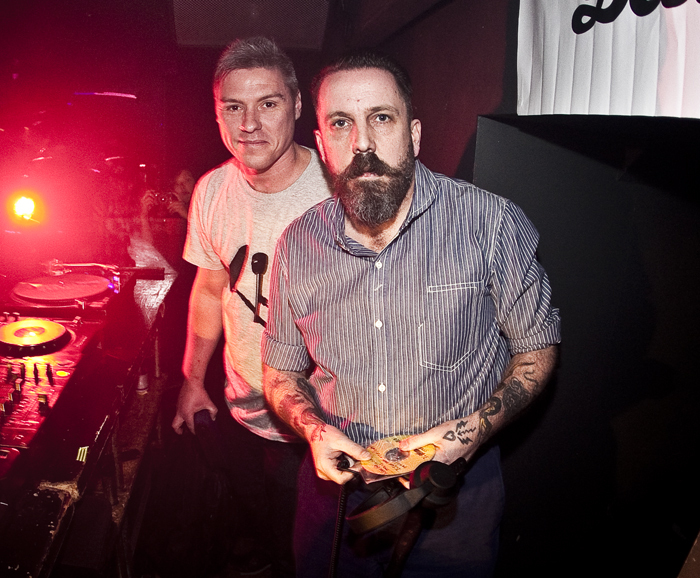 Disco Deviant were treated to an absolutely sublime aural feast last time Andrew Weatherall graced the decks for us back in April. We have been loving Mr Weatherall's style for over 2 decades now and he still cuts it for us having been consistently impressive with some amazing remixes of recent. We're happy to have him back to headline for us again at Audio. The last event was superb and totally sold out in advance, so we are expecting more of the same this time too. 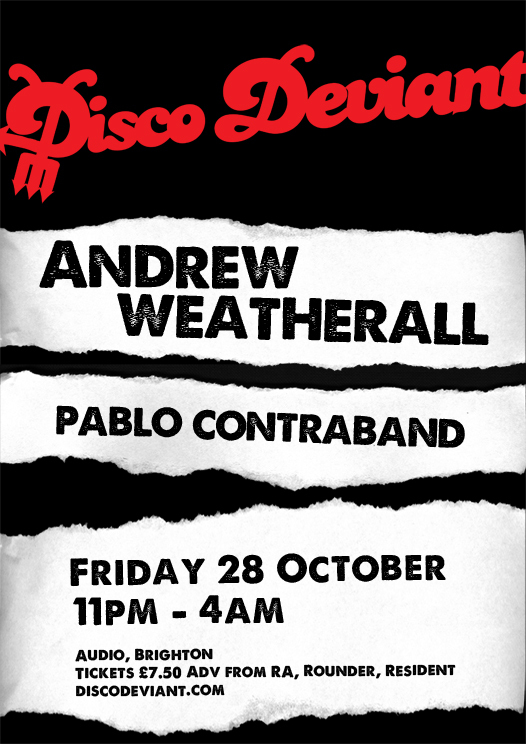 Pablo Contraband will be warming things up for us and setting the tone for what promises to be another quality Disco Deviant party. New EP from House of Disco featuring 4 tracks from various artists that I'm assuming are favourites of theirs is set to drop on vinyl shortly and here's where you can pre-order yours. The last one was a really good vinyl release selling a fair whack before they let it go out on digital. 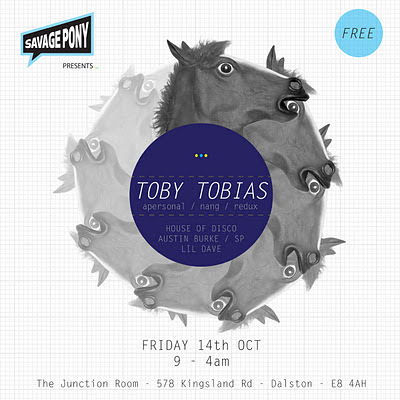 They also co-run a monthly session in Dalston under the guise of Savage Pony at the recently re-furbed Junction Room. Last month they had Tornado Wallace join them in testing the frequencies of the all new sound system, it's safe to say it passed the acid test. This month see's Toby Tobias guesting with the option of 2 rooms to choose from playing in. The basement has now opened its doors for business and will add another dimension to the venue. Why not take a trip down there on Friday Oct 14th and see for yourself. Savage Pony kicks off at 9pm and keeps going deep into the early hours - amazingly it's FREE. Next up another Japanese import this time from Scotland based Lord of the Isles. Pacific Afinity EP is a lovely 5 track release worthy of the £13.99 price tag in my opinion. Lovely soundscapes, slo mo beats and ambient atmospherics as well as some acidic grooviness pepper the EP and make this purchase all the more alluring. A COS/MES remix finishes the B-Side with a pumping dancefloor version of To & Fro.